The weaponization of the FBI's counterintelligence operations on behalf of Hillary Clinton? Say it ain’t so!!! Representative Mark Meadows has announced on twitter that DOJ official Bruce Ohr has been scheduled to testify on August 28th, this month. According to additional details provided to the Daily Caller, Ohr will testify to the same joint committee that previously heard testimony from Lisa Page. The joint committee is a blend of House Oversight (Trey Gowdy, Chairman) and House Judiciary (Bob Goodlatte, Chairman). If the same process is used, Chairman Goodlatte will determine which committee members will conduct the questioning. Senior Executive Service once again. 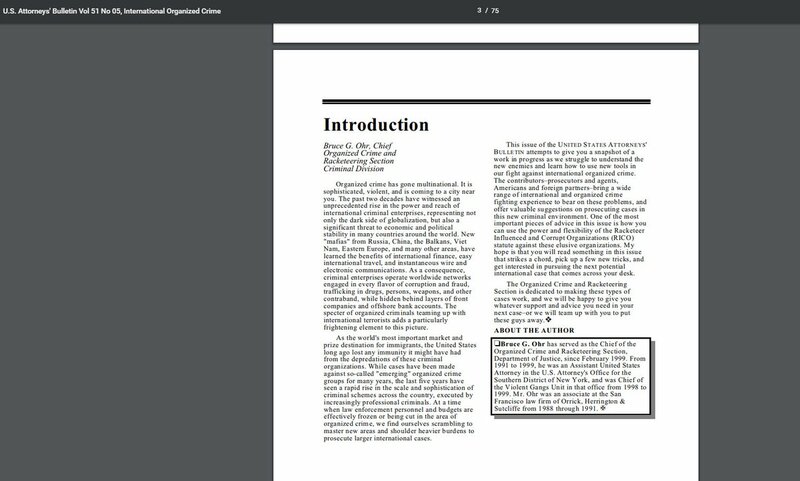 Interesting that Ohr was on the Organized Crime / Drugs beat. Not hard to limn why he'd have Trump on his radar. Prof. Sekyu Michael Ohr, chairman of the Materials Science and Engineering Department, State University of New York at Stony Brook, passed away on May 16, 1988 after a brief illness. Prior to joining the university in January 1986, Prof. Ohr completed a 22-year career at Oak Ridge National Laboratory. A memorial scholarship fund has been established in his name at the university. The Steele Dossier was truly a gift -- this discovery process has been fantastic, a public education on tradecraft getting dripped out like a proper ARG. the weaponizing of a word is so cute ...don't you think? now that you have decided to follow trump so closely also ...what does that make you? Bottom line: Trump tried to cover up his campaign’s contacts with a Russian national—which, at very least, constituted a violation of federal law. Bottom line: Trump cannot be permitted to recklessly and needlessly endanger millions of Americans with his unstable behavior. Bottom line: Trump’s threats against political opponents are threats against American democracy. Bottom line: Trump’s threats against freedom of the press are also threats against American democracy. Sean Hannity charged that Steele’s dossier was “claptrap” filled with “Russian lies” that were intended to poison “our own intelligence and law-enforcement network” against Trump. Have any of the nutters obsessing about Christopher Steele to Bruce Ohr revealed whether ongoing comms between them were related to TRUMP or just to organized crime, though I admit the distinction is hard to sustain. "The Steele Dossier was truly a gift -- this discovery process has been fantastic, a public education on tradecraft getting dripped out like a proper ARG." It does feel like I'm watching people playing a game they are really enjoying. Very engaging. I'm just afraid that after the credit roll, the game ends down the memory hole like all the others. Well, maybe not afraid, but cynically suspicious. At the same time, I can see the drip drip of the arg serving more nefarious means. A public paralyzed into inaction by the unstoppable continuity of government and sanctity of high office, retreats into reading suspense novels until the whole sorry affair blows over. But maybe I look at things too conspiratorially. So far none of the right wing propagandists wailing that the MSM isn't covering the 2017 Ohr-Steele comms know whether those were Trump or organized crime discussions. 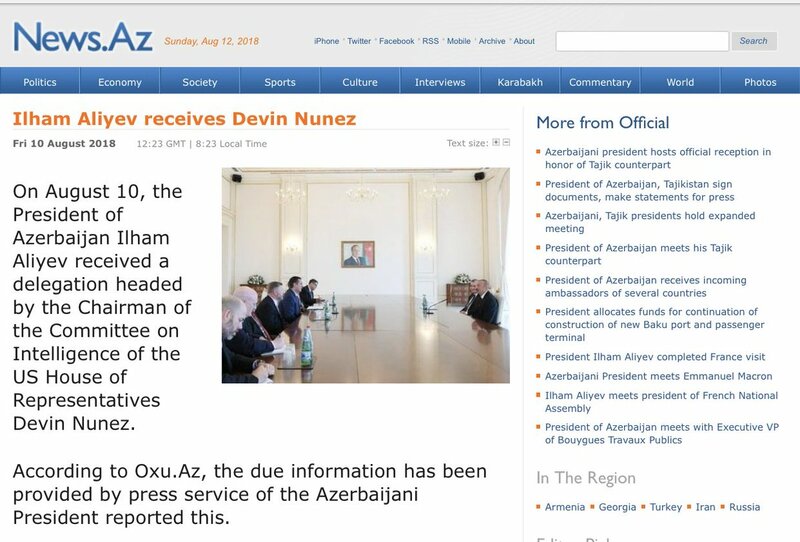 Can someone tell me what Devin Nunes is doing in Azerbaijan? DOJ official Bruce Ohr will come before Congress on August 28 to answer why he had 60+ contacts with dossier author, Chris Steele, as far back as January 2016. He owes the American public the full truth. "BRUCE OHR OF DOJ'S CRIMINAL DIVISION MOSCOW"
1. (C) SUMMARY. This cable, which should be read in conjunction with Septel analysis, details updates over the past year in Spain's two major operations - codenamed Troika (2008-09) and Avispa (2005-07) - to combat "Russian" organized crime in Spain. In Spain, the term "Russian mafia" usually applies not only to Russians, but also to many nationalities from the former USSR, according to Carlos Resa, a professor at the Autonomous University of Madrid who formerly worked at the UN Office on Drugs and Crime in Moscow. END SUMMARY. 2. (U) Phase I of Op Troika, which was executed in June 2008 resulted in the arrest of 20 top leaders of Russia's Tambov-Malyshev crime family for criminal conspiracy, money laundering, document falsification and crimes against public finances. Most of those arrested were "Vor z Konen" or "Thieves in Law," the highest echelon of Russian OC leadership. In particular, Gennadios Petrov, the alleged leader, Alexander Malyshev, Petrov's deputy, and Vitaly Izguilov, a key lieutenant who was out on bail from his arrest in Op Avispa, allegedly formed the leadership of one of the four largest OC networks in the world and the largest Russian OC network. Spain served as the group's safehaven from authorities and rival OC networks in Russia from which they directed their illicit business. Baltasar Garzon, the National Court judge who directed the investigation, accused the group of laundering money in Spain that came from a range of illicit activities conducted elsewhere, including contract killings, arms and drug trafficking, extortion, coercion, threats, and kidnapping. 3. (U) Following the Troika arrests in June 2008, details began to appear in the press on the group's alleged activities and how the investigation developed. Less than a month after the arrests, Spain's flagship daily, center-left El Pais, published a detailed article claiming that Alexander Litvinenko - the former Russian intelligence official who worked on OC issues before he died in late 2006 in London from poisoning under mysterious circumstances - tipped off Spanish security officials on the locations, roles, and activities of several "Russian" mafia figures with ties to Spain. He allegedly provided information on Izguilov, Zahkar Kalashov, and Tariel Oniani to GOS officials during a May 2006 meeting. partners that their illicit deals would proceed as planned. The press suggests this "sensitive" evidence could impact bilateral relations and adds that the "extremely delicate" details of Op Troika are so close-hold that barely 10 GOS officials are aware of them all. In the context of the clout that Petrov's network enjoyed and the political connections it had, multiple Spanish media outlets reported that one of Petrov's intercepted phone conversation suggests the Russian XXXXXXXXXXXX reportedly was sailing on Petrov's yacht on September 6, 2007, an allegation that Russia's Ambassador to Spain publicly denied as "completely false." 5. (U) In October 2008, GOS authorities raided the Mallorca vacation mansion of Vladislav Reznik, chair of the Duma's financial markets committee and a Putin ally within the United Russia party (See Ref B). XXXXXXXXXXXX There is some debate about whether Reznik bought the house from Petrov or whether it was a gift. In any event, the two were regularly seen together on the island, according to press reports. Garzon reportedly has ordered Reznik's arrest for money-laundering and for belonging to a criminal organization. Reznik enjoys immunity in Russia, but Garzon's extradition request is valid throughout the EU-27. In August 2009, the Spanish press reported that Garzon is investigating claims that Reznik and the Tambov crime family were involved in a 2008 plot to kidnap the eldest son of Spanish construction magnate Francisco Hernando del Saz (aka Paco el Pocero), one of the richest men in Spain. The plot, disrupted in April 2008, was to ask for a ransom of $30 million dollars. The leader of the would-be kidnappers reportedly alleges that he received his orders from Reznik. 7. (U) Multiple press reports allege that Moscow was left out of the loop on the Troika investigation - whose Phase II raid resulted in the detention of three lawyers in southern Spain in April 2009 - due to Madrid's fear of leaks to GOS OC targets. Moscow reportedly is interested in learning what exactly the Spanish have as evidence and has sent investigators to Spain for meetings with GOS officials on more than a half a dozen occasions since the Troika Phase I arrests. Spanish President Zapatero and Russian President Medvedev have met three times since then, including in Madrid in March 2009, when the two leaders upgraded the bilateral relationship to a strategic partnership and signed an MoU on cooperation on OC matters. (See Ref D). Spanish real estate market. The op had mixed results: Phase I, executed in 2005, arrested 28 suspects, 22 of which were alleged "Vor z Konen" (See Ref E). Phase II in 2006 arrested nine additional suspects while Phase III in 2007 resulted in three more arrests, including the Spanish national government's number-two official in the Catalan region, for allegedly helping members of the "Russian" mafia secure work visas to allow them to enter the country legally. Although GOS officials in 2005 publicly proclaimed Avispa a success, subsequent press reports suggest authorities struggled with leaks and bureaucratic snafus. Zahkar Kalashov and Tariel Oniani - Georgian-born Russian citizens who were the primary Avispa targets - apparently were both tipped off hours before the 2005 raid occurred and fled the country. Recent Spanish press reports suggest the source of the tip-off remains unidentified, although the Russian security services or a corrupt source within the GOS have been cited as possible culprits. Due to the leak, Izguilov was the most senior person arrested, although he later was released on bond from jail due to a technicality. Kalashov - allegedly the top boss of Russia's "Solnstevo" crime syndicate - was detained in Dubai in 2006 and quickly extradited to Spain, which had put out an arrest warrant for him via Interpol. 9. (U) The Spanish media often describes Kalashov as the "most valuable and well-protected prisoner in a Spanish jail" and the "highest level mafia boss arrested outside Russia." Kalashov - like Petrov, Malyshev, and Izguilov from Op Troika - is in an individual cell in an isolation block; all four are in different prisons. Kalashov faces numerous extra security measures and is periodically moved from prison to prison to foil any plots to break him out of jail, according to Spanish press (see Ref F). 10. (U) Investigating Judge Andreu in October 2008 formally charged 15 of the 37 people arrested in the first two phases of Avispa for money laundering, criminal conspiracy, and falsifying commercial documents. He is seeking 3-12 years for the defendants, including 12 years and two months for Kalashov, but a trial date has not yet been set. 11. (U) Against the backdrop of Lukoil's reported interest in acquiring a roughly 30 percent stake in Repsol (See Refs G and H), the Spanish press in November 2008 highlighted that Kalashov owned a "significant" share in Lukoil and that he and Tariel Oniani had acted as consultants during 2003-04 to help bring the Russian energy giant into Spain to open 150 gas stations, among other projects. Citing files provided by Swiss prosecutors, Spanish court documents estimate Kalashov's personal fortune at 200 million euros. 12. (U) Kalashov shuffled his attorneys in December 2008. Days later, one of his new lawyers, Alfonso Diaz Monux, was shot dead in his Madrid garage by unknown hitmen, although by all accounts, Diaz had received death threats for roughly a year due to his work on behalf of another client. although they acknowledged that police officers met their father at their home in his dying days. 14. (SBU) Spanish press reports suggest that Madrid has expressed interest in the extradition of Tariel Oniani, whom Russian authorities arrested in Moscow in June 2009. Spain has sought Oniani through Interpol since 2005. However,XXXXXXXXXXXX suggested to POLOFF on August 17 that Moscow is unlikely to extradite Oniani to Spain. "Counselor for Transnational Organized Crime and International Affairs in the Criminal Division of the U.S. Department of Justice. Previously the Chief of the Organized Crime and Racketeering Section in the Criminal Division from 1999 through 2011." 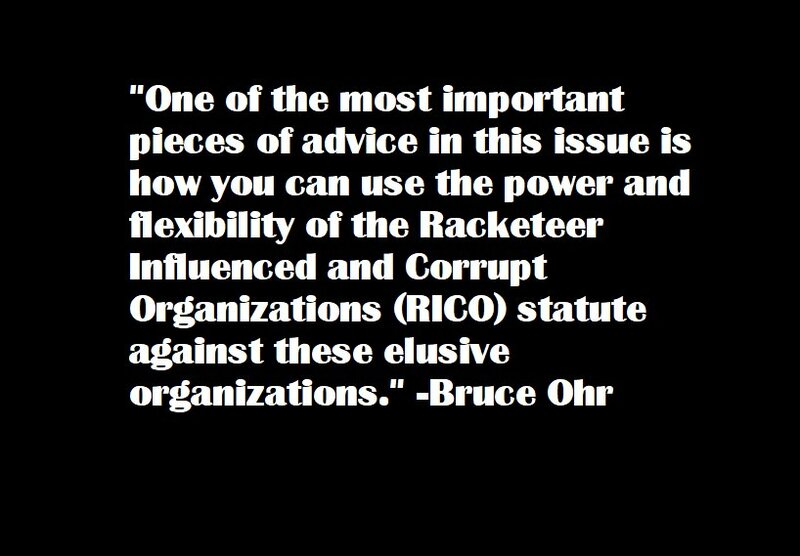 Bruce Ohr is the Counselor for Transnational Organized Crime and International Affairs in the Criminal Division of the U.S. Department of Justice. He was previously the Chief of the Organized Crime and Racketeering Section in the Criminal Division from 1999 through May 2011. Prior to that Mr. Ohr was an Assistant United States Attorney in the U.S. Attorney’s Office for the Southern District of New York from 1991 to 1999, and was Chief of the Violent Gangs Unit in that Office from 1998 to 1999. Mr. Ohr was an associate at the San Francisco law firm of Orrick, Herrington & Sutcliffe from 1988 through 1991. Bruce graduated from Harvard College in 1984 with a degree in physics. He graduated from Harvard Law School in 1987 and clerked for Judge Spottswood Robinson of the U.S. Court of Appeals for the D.C. Circuit from 1987 to 1988. "Bruce graduated from Harvard College in 1984 with a degree in physics. He graduated from Harvard Law School in 1987 and clerked for Judge Spottswood Robinson of the U.S. Court of Appeals for the D.C. Circuit from 1987 to 1988." "In May 2013, Bruce Ohr attended the Ministry of Justice’s third annual International Legal Forum in St. Petersburg, Russia and spoke on a panel entitled “Criminal Matters and Allegations of Crime in International Arbitration.”"
LISBON, Portugal -- Portuguese and European police say they have broken up a cell of an important Russian mafia group that allegedly laundered money through European football clubs. Europol, the European Union's law enforcement agency, said in a statement on Wednesday the group identified EU football clubs in financial distress and infiltrated them with benefactors who brought much-needed cash. Once they were in control, the mobsters allegedly laundered millions of euros through player transfers, TV rights deals and betting. Portuguese and European police on Tuesday raided third-division Portuguese club Uniao de Leiria and arrested three key members of the Russian gang. Three other Portuguese clubs' premises were searched. Europol said the operation helped identify serious crimes in Austria, Germany, and the United Kingdom, though it gave no details. Head of Europol's Financial Intelligence Group, Igor Angelini, said: "The misuse of offshore companies to conceal the beneficial ownership of assets is still one of the major challenges for successful financial investigations. "These barriers also frustrate the attempts of investigators to trace the origin of the money, often criminal, which is re-invested in sectors prone to such infiltration. The football sector presents vulnerabilities related to its structure, finance model and culture which could be exploited by criminals." Nellie Ohr earned a degree in history and Russian literature at Harvard and received a doctorate degree from Stanford in history. She is also a member of the Women in International Security. Meadows, you really ought not to bring this up. We are keeping it a secret from the MAGAs that the US and U.K. spies talk to each other. They think the FISA case was built on the dossier. If they find out it was real intelligence gathering, they will call you a liar. and now back to my question .....What is Nunes doing in Azerbaijan? 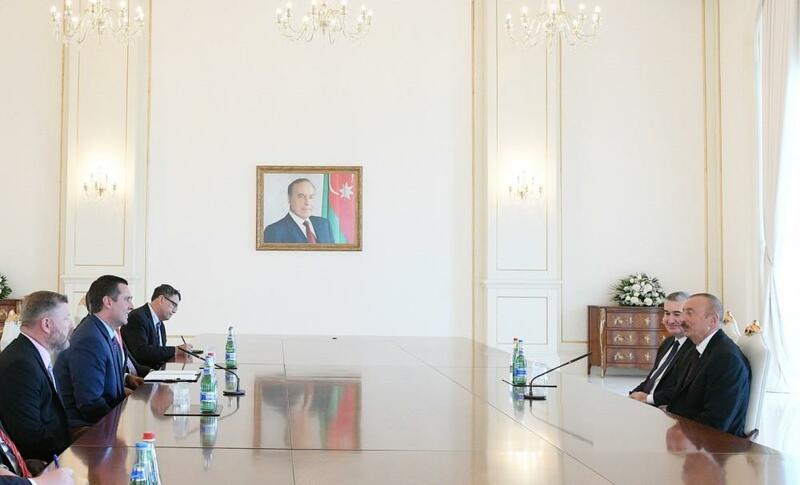 President of the Republic of Azerbaijan Ilham Aliyev has received a US Congressional delegation led by Chairman of the House Permanent Select Committee on Intelligence Devin Nunes and including member of the committee Rick Crawford. The successful development of the bilateral relations between the Republic of Azerbaijan and the United States of America in political, economic, energy and security areas was stressed at the meeting. The sides said Chairman of the United States House Permanent Select Committee on Intelligence Devin Nunes`s visit to Azerbaijan will contribute to the expansion of cooperation. Azerbaijan`s active support for peacemaking operations in Afghanistan was hailed, and the sides expressed their confidence that the two countries will continue making efforts to combat international terrorism. Here's that pic by itself. Suitable for framing. In 2012, corruption watchdog Transparency International reported that two-thirds of the world's countries may be considered "highly corrupt." It would seem tough to choose someone for the dubious honor of corruption's "person of the year." One investigative-journalism NGO has done just that. The Organized Crime and Corruption Reporting Project (OCCRP), based in Sarajevo and Bucharest, has awarded the crown to Azerbaijani President Ilham Aliyev. The group, which specializes in reporting on corruption in the region stretching from Eastern Europe to Central Asia, also gave out some "honorable" mentions. They went to alleged Kosovo-born cigarette and drugs smuggler Naser Kelmendi, Montenegrin Prime Minister Milo Djukanovic, Russian President Vladimir Putin, politically connected Serbian entrepreneur Miroslav Miskovic, longtime Uzbek President Islam Karimov, and wanted Serbian drugs smuggler Darko Saric. The informal list was determined by representatives of the 15 international media organizations that make up the OCCRP. It is aimed at highlighting the intrepid and often courageous reporting that is needed to expose corruption in these notoriously opaque countries. The OCCRP gave the nod to Aliyev, citing extensive reports and "well-documented evidence" that "the Aliyev family has been systematically grabbing shares of the most profitable businesses" in Azerbaijan for many years. The reports include secret ownership stakes in banks, construction firms, gold mines, and telecommunications firms. Many of the reports about Aliyev were investigated by OCCRP affiliate Khadija Ismayilova, a journalist with RFE/RL's Azerbaijani Service. "President Aliyev and his family, in fact, along with other persons in his inner circle are involved in so many secret businesses that we uncovered, actually together with Radio Free Europe this year," says Paul Radu, OCCRP's executive director. "We identified hidden companies that were owned by the first family of Azerbaijan in Panama, for instance, or in the Czech Republic. And we identified assets that they owned back in Azerbaijan via these companies." Radu is optimistic about the new tools that are making this kind of reporting more and more effective. One example he cites is that OCCRP has successfully partnered with a Scottish computer hacker. "He works right now with us at the Organized Crime and Corruption Reporting Project and he is the one who scraped [eds: got into] the Panamanian registry of companies and that allowed us to perform name-based searches," Radu says. "And this is how we found the companies that are owned by the daughters of Aliyev and by his wife in Panama." However, Radu adds that the impact of such reporting in the case of the Aliyev family has not been what one might hope. The ownership structures of the family's foreign assets have been changed; the Azerbaijani parliament in June passed a law making it more difficult to discover who actually owns commercial companies and shielding Aliyev and his family from prosecution. Moreover, journalist Ismayilova was subjected to a terrifying campaign of threats and harassment that she alleges was orchestrated by Aliyev's political allies. Nevertheless, OCCRP editor Drew Sullivan says that "2012 was a banner year for those of us who cover organized crime and corruption. It is a growth industry around the world." According to Radu, the OCCRP is now combining numerous international databases and linking them to the organization's ongoing files of "persons of interest" -- future candidates to unseat Aliyev as "person of the year." The OCCRP list is also intended to highlight the global impact of crime and corruption. Radu maintains that most of the people on the OCCRP list have dubious and opaque ties far beyond the borders of their country. "There are persons such as Darko Sadic, for instance, who is a well-known drug trafficker," he says. "And these sorts of persons are not well-known outside of the Balkans, but in fact they are part of very, very large networks that stretch sometimes across continents. In this case, this person was involved in cocaine trafficking from Argentina all the way to the Balkans." Radu adds that organized crime from the Balkans and the former Soviet Union is deeply involved in the savage drug wars in Mexico and in massive resource theft from impoverished countries in Africa. This makes it all the more important to expose these people and the corrupt schemes they exploit, he says. The Trump Tower Baku never opened. Trump partnered with an Azerbaijani family that U.S. officials called notoriously unethical. Heydar Aliyev Prospekti, a broad avenue in Baku, the capital of Azerbaijan, connects the airport to the city. The road is meant to highlight Baku’s recent modernization, and it is lined with sleek new buildings. The Heydar Aliyev Center, an undulating wave of concrete and glass, was designed by Zaha Hadid. The state oil company is housed in a twisting glass tower, and the headquarters of the state water company looks like a giant water droplet. “It’s like Potemkin,” my translator told me. “It’s only the buildings right next to the road.” Behind the gleaming structures stand decaying Soviet-era apartment blocks, with clothes hanging out of windows and wallboards exposed by fallen brickwork. The timing of the project was also curious. By 2014, when the Trump Organization publicly announced that it was helping to turn the tower into a hotel, a construction boom in Baku had ended, and the occupancy rate for luxury hotels in the city hovered around thirty-five per cent. Jan deRoos, of Cornell University, who is an expert in hotel finance, told me that the developer of a five-star hotel typically must demonstrate that the project will maintain an average occupancy rate of at least sixty per cent for ten years. There is a long-term master plan to develop the area around the Trump Tower Baku, but if it is implemented the hotel will be surrounded for years by noisy construction projects, making it even less appealing to travellers desiring a luxurious experience—especially considering that there are many established hotels on the city’s seaside promenade. There, an executive from ExxonMobil or the Israeli cell-phone industry can stay at the Four Seasons, which occupies a limestone building that evokes a French colonial palace, or at the J. W. Marriott Absheron Baku, which has an outdoor terrace overlooking the water. Tiffany, Ralph Lauren, and Armani are among the dozens of companies that have boutiques along the promenade. The Azerbaijanis behind the project were close relatives of Ziya Mammadov, the Transportation Minister and one of the country’s wealthiest and most powerful oligarchs. According to the Transparency International Corruption Perceptions Index, Azerbaijan is among the most corrupt nations in the world. Its President, Ilham Aliyev, the son of the former President Heydar Aliyev, recently appointed his wife to be Vice-President. Ziya Mammadov became the Transportation Minister in 2002, around the time that the regime began receiving enormous profits from government-owned oil reserves in the Caspian Sea. At the time of the hotel deal, Mammadov, a career government official, had a salary of about twelve thousand dollars, but he was a billionaire. After Donald Trump became a candidate for President, in 2015, Mother Jones, the Associated Press, the Washington Post, and other publications ran articles that raised questions about his involvement in the Baku project. These reports cited a series of cables sent from the U.S. Embassy in Azerbaijan in 2009 and 2010, which were made public by WikiLeaks. In one of the cables, a U.S. diplomat described Ziya Mammadov as “notoriously corrupt even for Azerbaijan.” The Trump Organization’s chief legal officer, Alan Garten, told reporters that the Baku hotel project raised no ethical issues for Donald Trump, because his company had never engaged directly with Mammadov. The Baku project is hardly the only instance in which the Trump Organization has been associated with a controversial deal. The Trump Taj Mahal casino, which opened in Atlantic City in 1990, was repeatedly fined for violating anti-money-laundering laws, up until its collapse, late last year. According to ProPublica, Trump projects in India, Uruguay, Georgia, Indonesia, and the Philippines have involved government officials or people with close ties to powerful political figures. A few years ago, the Trump Organization abandoned a project in Beijing after its Chinese partner became embroiled in a corruption scandal. In December, the Trump Organization withdrew from a hotel project in Rio de Janeiro after it was revealed to be part of a major bribery investigation. Ricardo Ayres, a Brazilian state legislator, told Bloomberg, “It’s curious that the Trumps didn’t seem to know that their biggest deal in Brazil was bankrolled by shady investors.” But, given the Trump Organization’s track record, it seems reasonable to ask whether one of the things it was selling to foreign partners was a willingness to ignore signs of corruption. An earlier version of this article misspelled the name of the J. W. Marriott hotel in Baku. Construction of the Trump Tower in Azerbaijan has been abandoned in December 2016. An unopened Trump hotel in Azerbaijan has been linked to corrupt officials who support the Iran's Islamic Revolutionary Guard Corps, reports Adam Davidson in a New Yorker piece. Trump International Hotel & Tower Baku, a sleek 5-star hotel in the shape of a ship sail in Azerbaijan's capital, never opened despite appearing nearly complete. Plans to build the tower began in 2008, when developers first drew up a "high-end apartment building" downtown in the capital of Azerbaijan. In 2012, the Trump Organization and Azerbaijani developers signed off on a contract to turn the building into a luxury hotel. 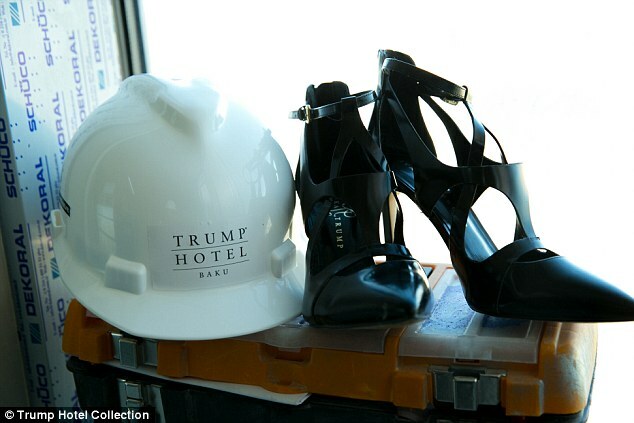 Even though the hotel has Trump's name emblazoned on it and had previously been posted as a future project on Trump Organization's website, the organization's chief legal officer Alan Garten said that Trump played only a nominal role in construction of the hotel — he was "merely a licensor" who had allowed Anar Mammadov, the son of powerful Azerbaijani oligarch Ziya Mammadov, to use his name, the New Yorker reports. Trump's own financial disclosure report showed that he earned $2.5 million in income from the project between January 2014 and July 2015 and an additional $323,000 afterwards. 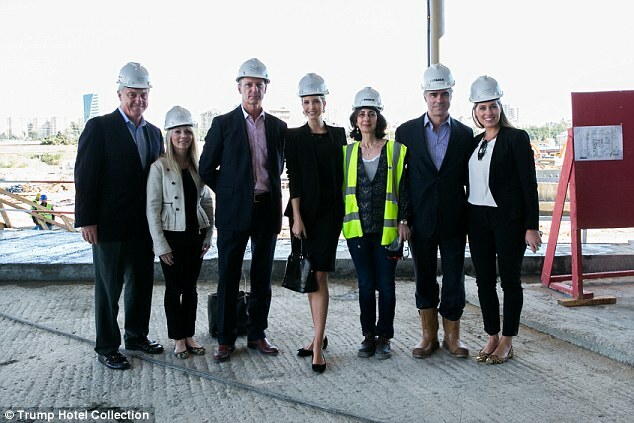 In 2014, Ivanka Trump visited the Baku construction site and posted photos and videos of her trip to Instagram. Donald J. Trump displays an artist's concept of "Television City," which would be on the far west side of Manhattan, Nov. 18, 1985. But some in Azerbaijan allege the Trumps had a more active hand in the project. "We were always following their instructions," an unnamed Azerbaijani lawyer involved with the project told The New Yorker. "We were in constant contact with the Trump Organization. They approved the smallest details." 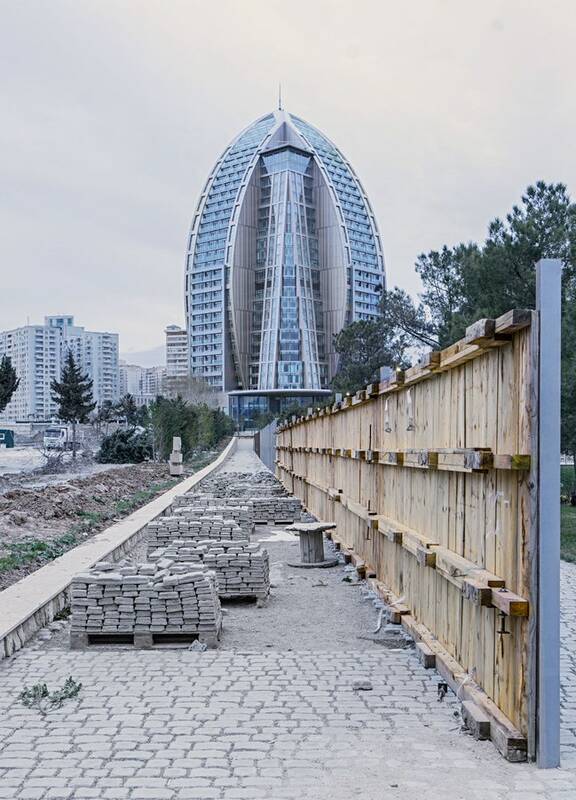 A few weeks before Trump took office as President, he cancelled construction of the nearly-finished building in Baku to avoid potential conflicts of interest even though the construction was in its final stages. Last June, The Washington Post reported that the hotel had plastic-wrapped reception desks in the lobby. Azerbaijan consistently ranks as one of the most corrupt countries in the world by human rights watchdogs — only two weeks ago, President Ilham Aliyev named his wife to serve as the country's Vice President. According to The New Yorker, the Trump Organization signed off on the deal with the powerful Mammadov family who, aside from regularly getting called out for exploiting political power to increase personal wealth, has reported ties with Iran's Islamic Revolutionary Guard Corps — anextremist military force that has helped finance Iran's nuclear weapons program and trained terror organizations like Hezbollah. Azerbaijan's Transportation Minister, Ziya Mammadov reportedly "awarded a series of multimillion-dollar contracts" to a construction company controlled by the IRGC in 2008, when development of the Baku Trump Tower first started. "The entire Baku deal is a giant red flag—the direct involvement of foreign government officials and their relatives in Azerbaijan with ties to the Iranian Revolutionary Guard," Jessica Tillipman, an assistant dean specializing in government anti-corruption at George Washington University Law School told the New Yorker. "Corruption warning signs are rarely more obvious." The 1977 Foreign Corrupt Practices Act forbids companies from "participating in a scheme to reward a foreign government official in exchange for material benefit or preferential treatment." However, Garten told The Washington Post that the organization's investigation into the Mammadov family "did not raise any red flags." Only last week, a Reuters report indicated that Trump's administration is currently trying to label the IRGC as a "terrorist organization." But only a few years ago, Trump's company evidently had few qualms about lending his name to a project that could benefit them. Azerbaijan has been in play since before Cheney, and it's a geopolitical play against Russia's dominance in the region. Ruppert used to talk about this all the time. The thing about a multipolar world is that any single move has multiple consequences. Building up investment & infrastructure in Azerbaijan creates both opportunities and challenges for Russian businesses & forpol -- and Iranian energy dominance, too. New Azerbaijan Party has a "special relationship" with Erdogan, not Putin.